I was busy baking cakes on Sunday afternoon. Actually I planned to make a fondant cake but I have to change my plan upon the request of my mum to make a durian cake, because she has got too much of durian in the fridge. 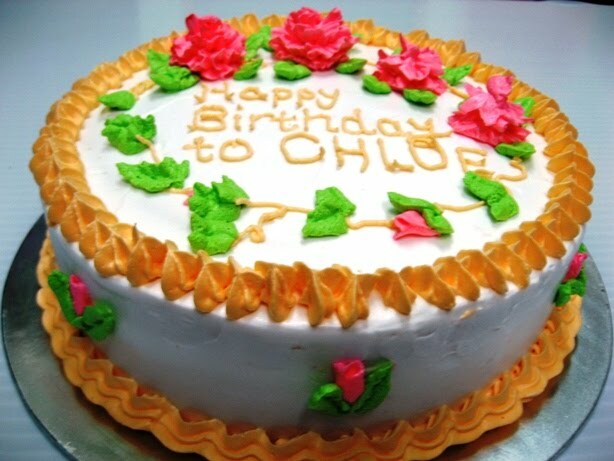 It is also our little niece, Chloe's 2nd birthday, big brother would like to have another cake to celebrate her birthday at night, though she has had one during lunch time at Promenade Hotel. Both are durian fresh cream cakes. It was tiring but fun having to bake and decorate 2 cakes in the same day, it's my first time doing so. Our two girls did not disturb me much while I was baking because their daddy already told them not to and they obeyed. They spent time watching their VCDs, did some drawings and played computers. I also cooked dinner during the intervals, so I managed to get the cakes decorated and dinner ready at dinner time. A durian cake requested by mum for our eating pleasure. Hey they both look good! Hope I'll have a chance to try your cake one day... Hehe.